This end of the year holidays we decided on going to Thekkady. It was on the spot decision. Phone calls were made to check for availability, bags were packed, and off we set off in the morning from Calicut. Thekkady is about 335 km from Calicut. From Calicut till Angamaly, the landscape was familiar. But once we crossed Angamaly, the surroundings were new and different, more greenery on all sides, we came by some awesome traditional heritages structures, which were a treat to the eyes. As we drove deeper and deeper, we passed by forests, breath taking sights of hills, rivers and water fall. Many were there sights which were worthy of getting down from the car and looking at. Thekkady and its sister town Kumily is mainly a tourist town with resorts and souvenirs shops, and its likes. 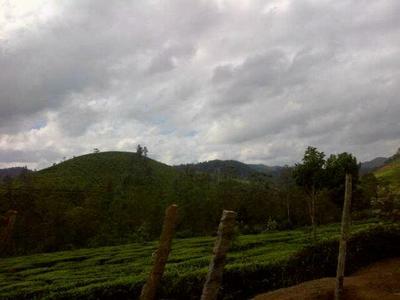 It is surrounded by thick ever green forest .It has quite few sightseeing place like the Famous Periyar National park. The Weather was cool and breezy. The resort we stayed was lovely being surrounded by thick trees. The room had a balcony which faced a hill. So it was lovely having a cup of tea with the hill as company. 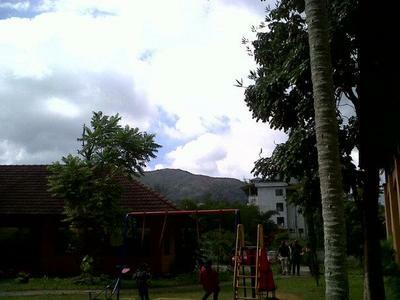 with beautiful Mountains and lush greenery. The Drive to Thekkady to and fro was itself very beautiful. It was wonderful to go to this lovely cool town deep inside Kerala. On way back to Calicut we stayed in the city of Ernakulum. This Fast paced city leaves you in awe. The Expanding skyline and the huge population and activity made me wonder whether this place is the part of the humble Kerala that I know. Ernakulum has great number of shopping places and restaurants and cafes. The Hotel we stayed had a lovely popular cafe below, which served deserts, cakes and snacks. The Marina is also a nice place to visit ,to look at the sea or take a boat ride. Fort Cochin is a heritage town in one part of Ernakulum. It has European history, which still reflects in the town, in the Europeans houses and quaint lanes there. All of them have been converted into hotels and cafes, but visiting each of them is like going back in time. Each lane gives you a pleasant surprise with names like Princess Street, Jew Street, Gujarati Street etc. Needless to say, Fort Cochin is best explored on a foot that is by walking. After two days we returned and after experiencing the hustle bustle of Ernakulum it was a pleasant feeling to reach the Calm evening of Calicut. Comments for Holidays in Deep South. I have always wanted to visit this this place but never been able to.. After reading this once makes me visit it. It's beautiful..